As you guys know, Magic Kingdom is our favourite to visit, the special moment walking down the Main Street never gets old! 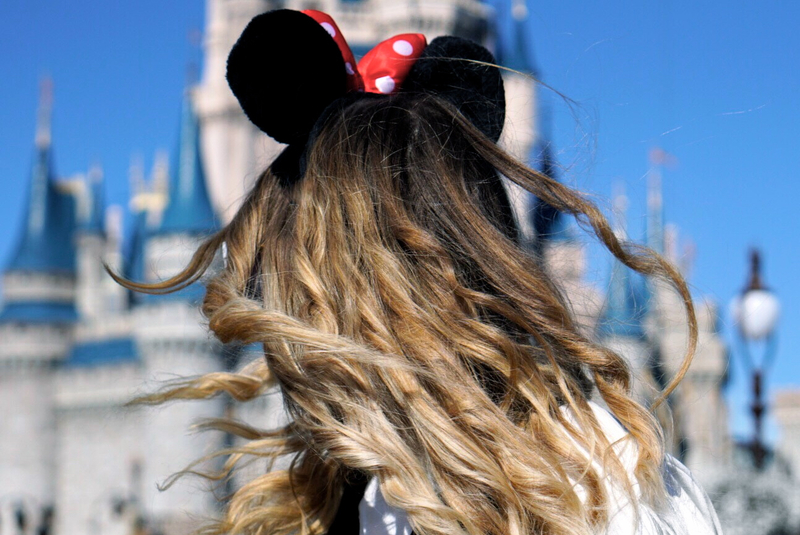 Looking down Main Street and seeing the magical Cinderella Castle is the most perfect view, and the most picturesque! We love taking pictures with the beautiful castle in the background, it's become a tradition so we had to take some pictures on this trip! We visited on such a lovely sunny day, which created the most amazing blue backdrop for our photos. 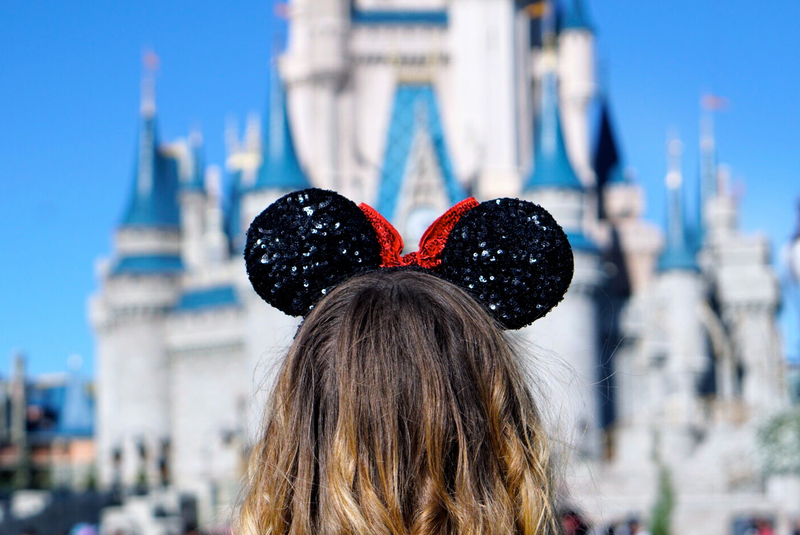 We wanted to talk through our Disney Magic Kingdom outfits that we wore around the park! There's a lot of planning that goes into the 'Magic Kingdom' outfit, and it's always the outfit that I'm most excited about wearing on our Disney trips! We always love to wear something Disney themed or with a hint of Disney for Magic Kingdom, it's only right! Lydia decided to wear her favourite In The Style Filo Black Denim Ripped Dungarees, which is a brand that we both love! 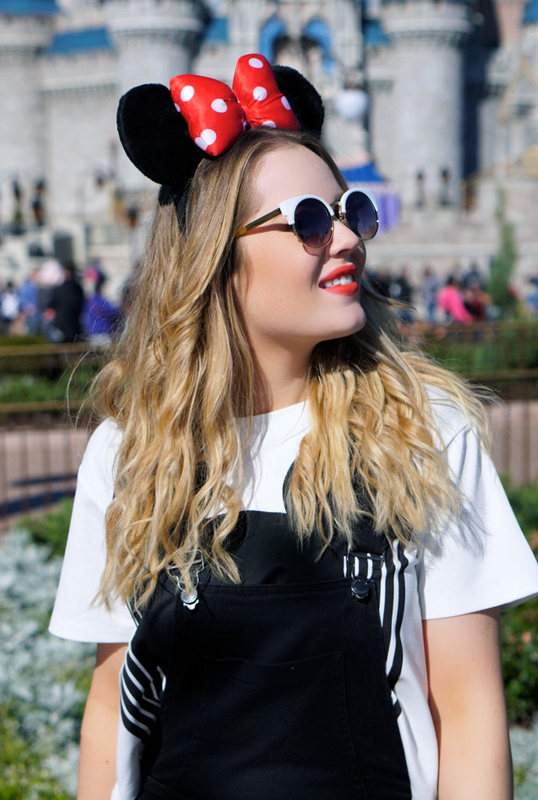 Dungaree's are the perfect theme park attire! If you are looking for Disney inspired clothing, t-shirts, jumpers or jackets, Forever 21 is one of the best places to find these! Lydia wore a Forever 21 Mickey White T-Shirt which just adds the right amount of Disney for the day! Forever 21 has such a wide range Disney clothing, definitely have a look on their website for Disney style! 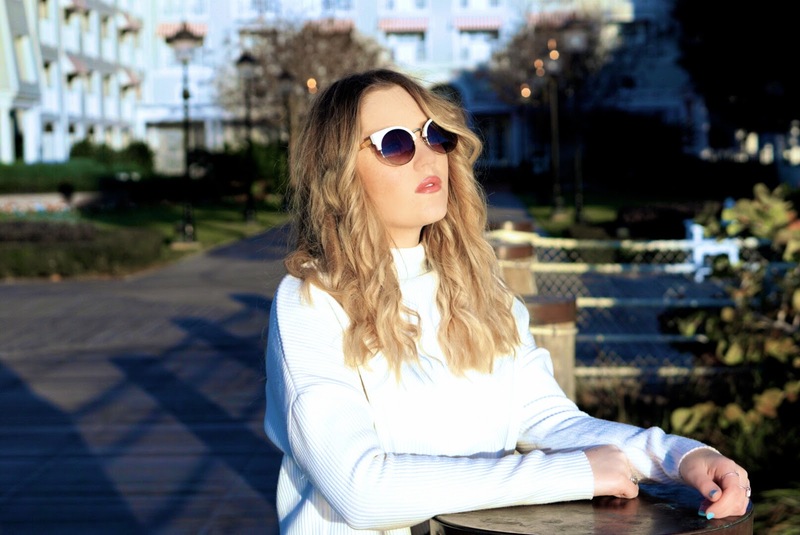 So many of you have asked about my sunglasses on Instagram, and they are the Missguided White Half Frame Sunglasses! 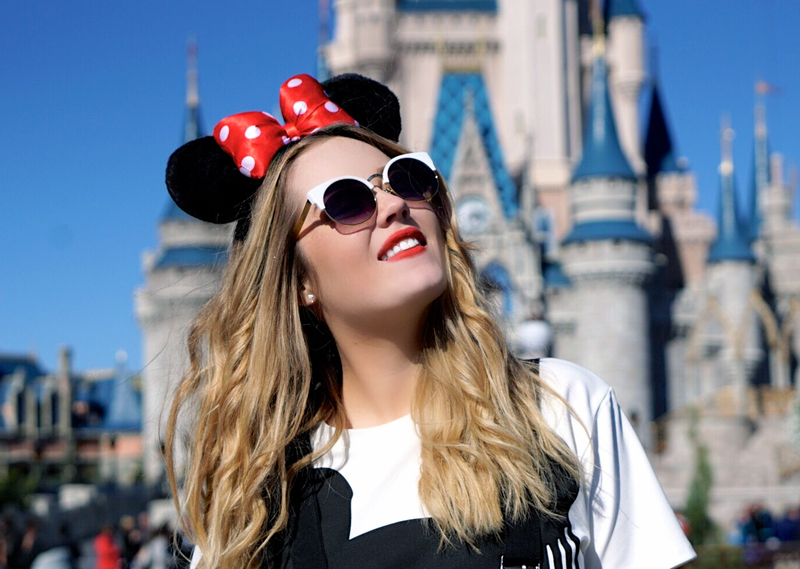 I loved wearing these sunglasses around the parks as they matched perfectly with my Minnie Mouse ears! To finish my look I wore the most comfiest New Look Black Canvas Slip On Plimsolls, which I then wore for most of the trip as they were so easy to slip on! 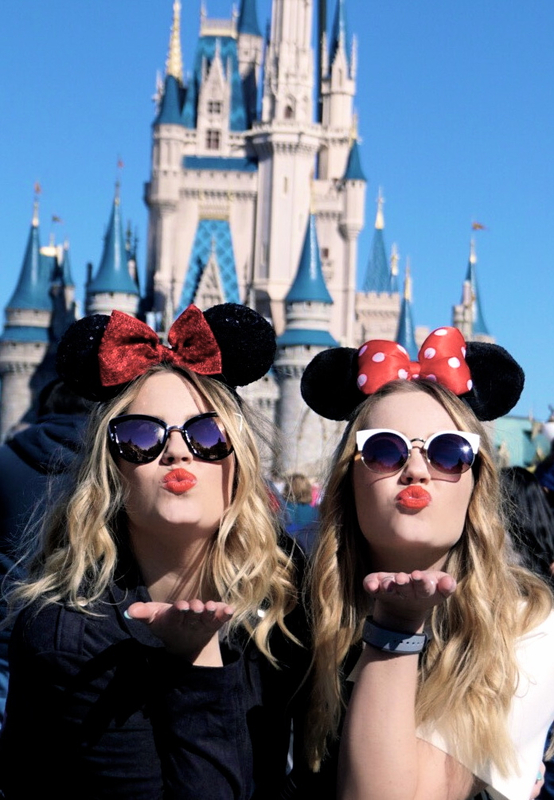 I always love to wear a bright red lip when I'm going to Magic Kingdom, in true Disney style! Whenever I want to wear a long lasting red lip, I always wear my favourite Nars Velvet Matte Lip Pencil in 'Red Square!' It always lasts all day on my lips, even without having to keep applying it! For my Disney outfit, I decided to keep my outfit quite casual but also comfortable! Mom style jeans are my new favourites, and I really like the cool high-waisted look of these 'Mom' jeans and the way these ones are slightly cropped! I got my ones from River Island a couple of years ago but I have found some similar, which are the ASOS Farleigh High Waist Slim Mom Jeans! I don't normally wear dark blue denim but I love the shape and fit of these jeans, and the distressed rip in the knees! 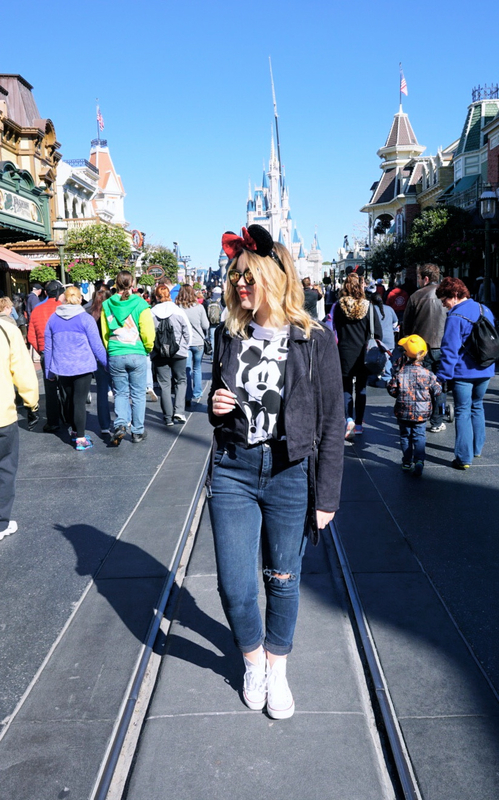 To add a bit of Disney to my outfit, I wore this Forever 21 Mickey Mouse Icon T-Shirt! I then wore my favourite jacket from the trip, my Missguided Faux Suede Biker Jacket, which I basically wore the whole time we were in Florida! It's going to be my perfect jacket for spring! This time, I decided to wear my sequinned Minnie Mouse ears and then finished my look with my Converse All Star Hi Top White Trainers and my Quay Australia 'My Girl' Sunglasses! I love these because of the cat eye shape and also because the lenses are slightly tinted pink! 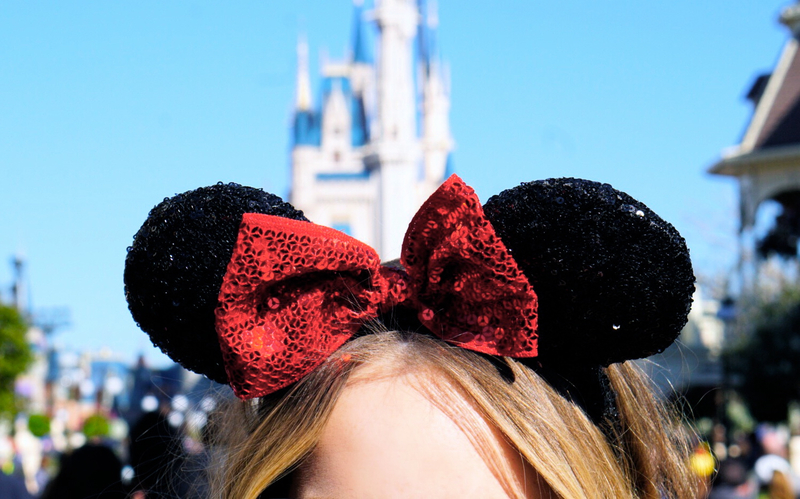 Let us know what you'll be wearing for your Disney trips and your favourite outfit! 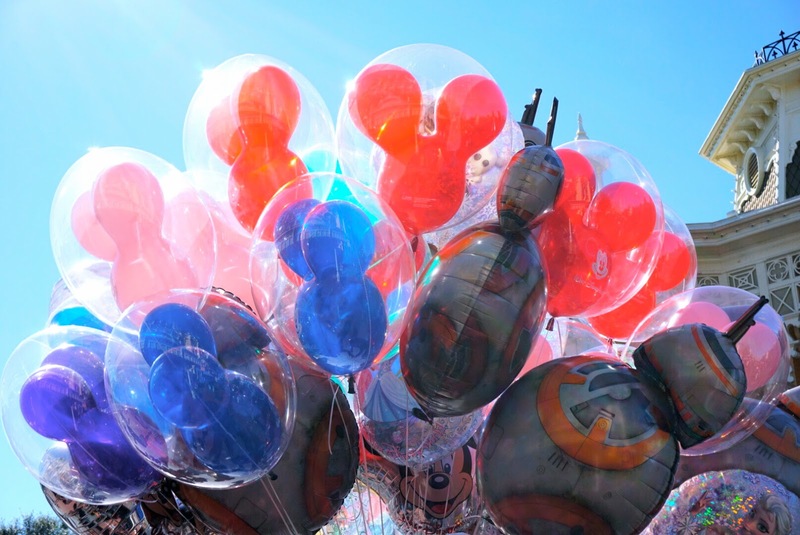 Last week we were lucky enough to go back to our favourite place, Walt Disney World! For the first couple of days of our magical trip, we stayed at the beautiful Disney's Beach Club Resort. This hotel is absolutely beautiful, I love the beach themed, sea inspired colour palette of this picturesque hotel. This hotel has a New England style to it, and it created the perfect backdrop for these photos! The Disney's Beach Club Resort is situated around Crescent Lake, overlooking the Epcot resort area, making this hotel super central to Walt Disney World and the all the parks. It's one of the prettiest, picturesque hotels that I have stayed in, so I knew we had to shoot some outfit posts here! I decided to stick with the same colour palette of the hotel and wear an outfit that is cool and casual. These Missguided pieces created the perfect 'Beach Club' casual outfit. 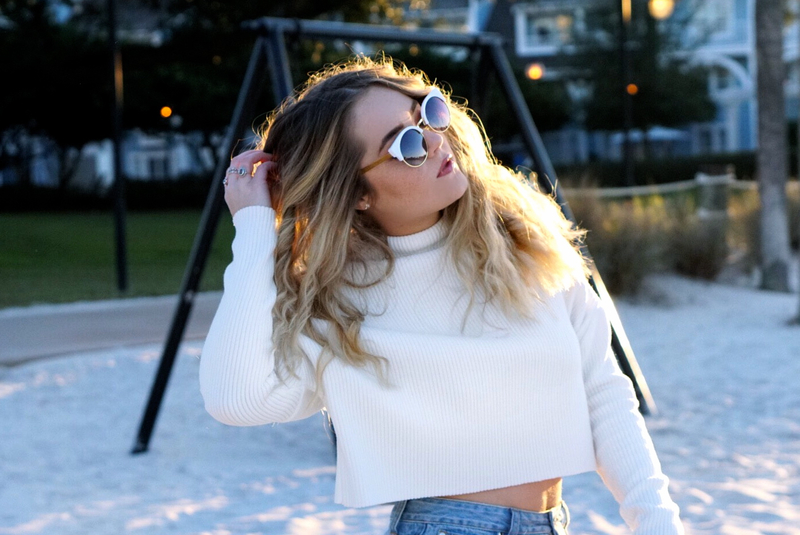 As it was quite chilly in Orlando as we visited in January, I decided to wear this Missguided Long Sleeve Turtle Neck Cropped White Jumper. I decided to pick up these Missguided Extreme Rip Bleached Blue Mom Jeans as I have always loved this style of jeans but never thought I would be able to pull it off! I think these jeans fitted the 'Beach Club' theme perfectly! These jeans are a much lighter wash than I normally wear, but I love the high waisted 'Mom' style and the distressed look of them. 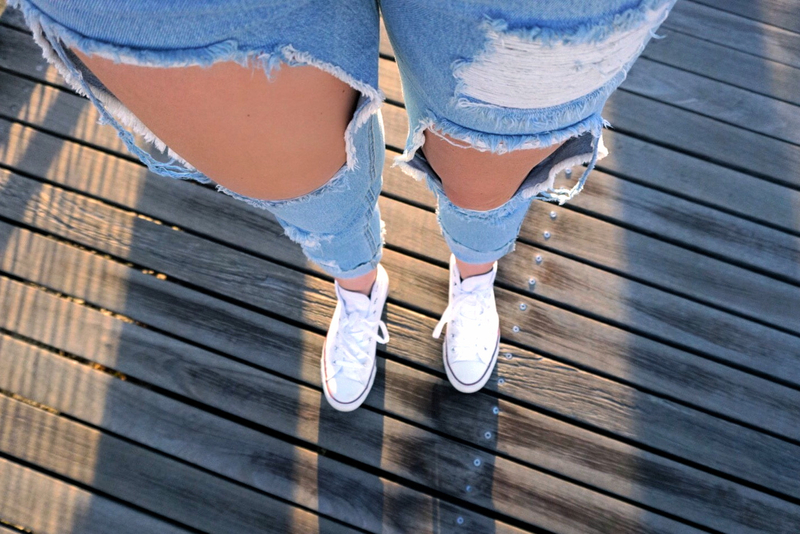 I would never normally wear jeans with such extreme thigh revealing rips in, but I saw a photo of my fave Perrie Edwards wearing ripped jeans like these and she looked amazing in them, so I wanted to try this look! It was such a sunny morning so of course I had to wear some sunglasses. So many of you guys have been asking me on Twitter and Instagram about these sunglasses so I had to talk about them! These Missguided Half Frame White Sunglasses are my new favourite! I love the white half frames and the gold detailing on the sides of the frames. 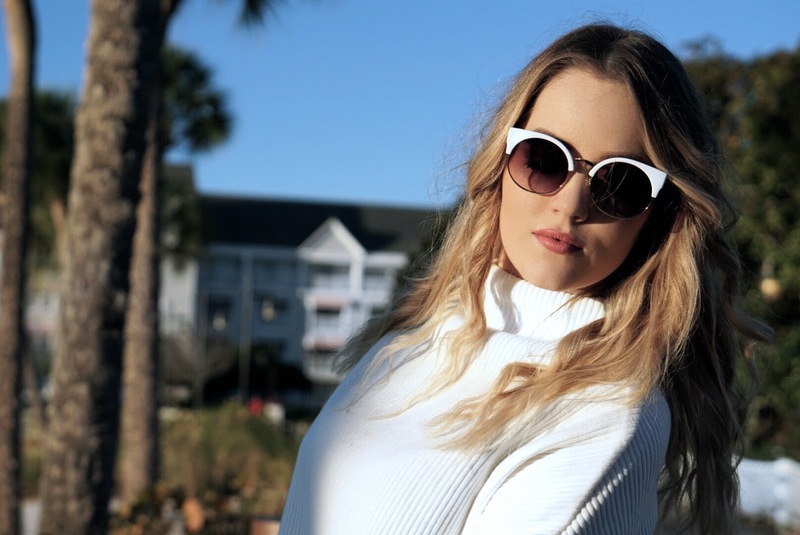 Round sunglasses are my absolute favourite, and these glasses matched my white jumper perfectly! I finished off my outfit with Lucy's Converse White All Star Hi Trainers which kept my look casual, but you could even dress up this look by wearing some really cute scrappy heels! I will link everything featured! 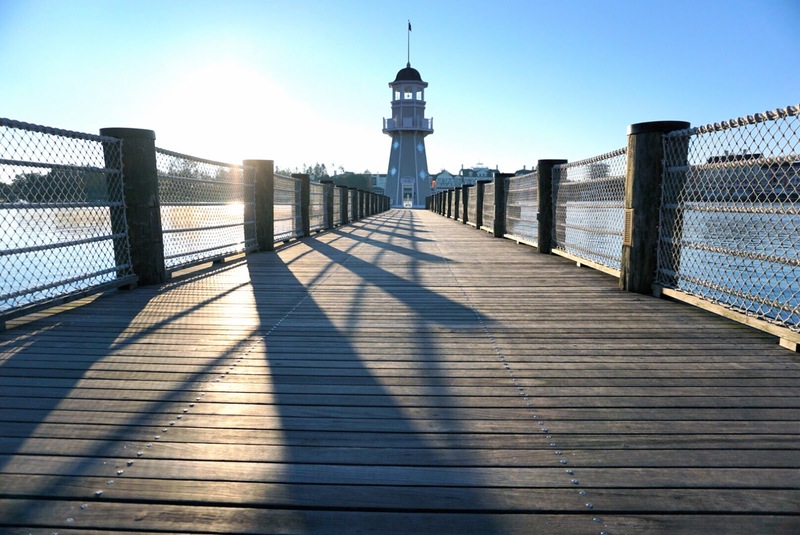 Click here for details on the beautiful Disney's Beach Club Resort!